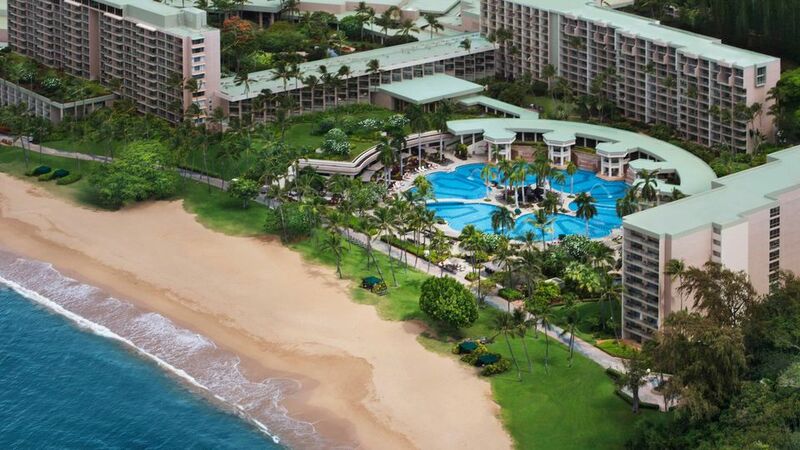 Located within the 800-acre Kauai Lagoons Resort, the Kauai Marriott Resort and Beach Club is a tropical oasis close to Kauai's principal town of Lihue. Situated on 51 acres on Kalapaki Beach, fronting Nawiliwili Bay, the resort is centrally located for those wishing to explore Kauai's North Shore, South Shore or Waimea Canyon and Kokee State Park. The resort recently underwent makeovers to unveil the new look and feel of Marriott. The resort has 356 hotel guest rooms, including 11 suites. There are also 190 one-bedroom and 42 two-bedroom Beach Club Suites. Approximately 100 of the Beach Club Suites may be used as hotel rooms on any given night. All hotel rooms include the new Marriott "Revive" bed and linen collection. Each room has air conditioning, a remote-control television, direct-dial telephone, lanai, refrigerator and either a king bed or two double beds. Approximately 80% of rooms offer views of the ocean/pool. Everything from resort wear by world-renowned designers and local artisans to original Hawaiian artwork and souvenirs can be found in the shops and galleries of the lobby level arcade. The resort has a total of eight meeting rooms with 19,702 square feet of indoor meeting space, and nearly 60,000 square feet of outdoor meeting space in ocean, garden and pool settings. On-site state-of-the-art audio/visual support and Wi-Fi Internet connection are offered. The 2,500-square-foot Fitness and Aerobics Center is open 24 hours daily. It features state-of-the-art workout stations, exercise equipment, and free weights. Aerobics, pilates and other instructional classes are offered throughout the week. The Kauai Lagoons Golf and Racquet Club are adjacent to the resort. The Kiele and Mokihana golf courses, both designed by Jack Nicklaus, offer 36 spectacular holes of world-class golf in a picturesque oceanfront setting. The Racquet Club offers two Plexi-paved courts and a lighted stadium court that seats 612 for tournament or exhibition play. Locker facilities are available as well as a golf and tennis pro shop. The Resort has numerous dining options. Kukui's Poolside Restaurant and Bar are open daily for breakfast lunch and dinner. It features a Pacific Rim buffet in an outdoor setting plus American and local specialties. Cafe Portofino Italian Restaurant is open nightly for dinner offering al fresco dining with the distinctive flavors of Northern Italy. Duke's Canoe Club is open daily for lunch and dinner and specializes in local island fare, fresh fish, seafood and steaks along the oceanfront. Ocean Front Terrace is open daily for lunch and dinner offering tasty American fare including pizza. Kalapaki Grill is open daily for lunch and offers light fare, pizza, burgers and grilled snacks by the pool. Aupaka Terrace offers morning continental breakfast and a nightly sushi bar. A Seaside Cabana or Private Gazebo Dinner is the ultimate dining experience. These exquisite dinners are served by a personal butler in one of the resort's four secluded gazebos overlooking Kalapaki Bay. Guest services include a complimentary airport shuttle, concierge and activities/tour desk, business center, valet service, guest laundry, safe deposit boxes, car rental desk, babysitting, Alexander Day Spa and Salon, coffee/tea in-room, free local phone calls, hi-speed Internet and local restaurant dinner delivery. The resort is beautifully landscaped. Much of the design actually dates back to the Westin days where the resort was constructed with beautiful interior courtyards. With koi ponds, tropical flowers, plants, and trees, you can easily feel that you're not close to the buildings themselves. Since opening in 1995, the resort has been committed to protecting and preserving Hawaii's culture through its "Hawaiian Art and Artifact" project. When the resort was a Westin it was filled with much oriental art. Much of this has been replaced by Hawaiian art which is more appropriate to Hawaii's Garden Isle. Placed throughout the hotel's common areas, the artifacts chosen include shark tooth weapons, ancient hula instruments and drums, and kapa cloth made in Hawaii over a hundred years ago. For the main entrance, master Hawaiian kahili makers crafted two kahili (feather standards) in purple (Kauai's royal color). Artwork chosen for the project includes replications of early 20th century Hawaiiana paintings, as well as a large wall mural of ancient Oceania that was originally created by a 19th-century explorer. Cosmetic enhancements and refurbishment were also included in the scope of the project. Bright tropical patterns characterize the newly reupholstered restaurant and lobby furniture. The new lobby area rugs also have tropically themed patterns. Overall you will definitely feel that you are in a Hawaii resort.